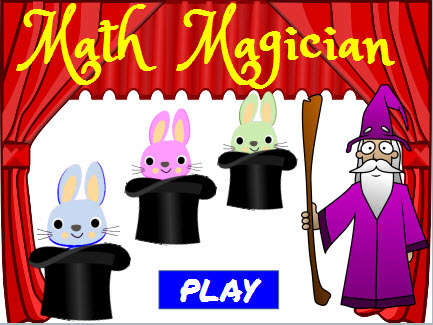 Play this fun Math Magician Division Game and make 20 bunnies disappear by quickly matching different division problems with the correct answer. Drag and drop each bunny into the correct basket to make it disappear. This interactive game provides kids with an engaging way to practice division facts. The game can be played on computers, iPads, and other tablets. You do not need to install an app to play this game on the iPad. Fluently multiply and divide within 100, using strategies such as the relationship between multiplication and division (e.g., knowing that 8 ×5 = 40, one knows 40 ÷ 5 = 8) or properties of operations. Return from this Math Magician Division Game to the Elementary Math Games webpage, or to Math Play.